Evidence-Based Oncology, the multistakeholder publication of The American Journal of Managed Care devoted to cancer care, revisits the rapidly evolving field of immuno-oncology in its current issue. While one author calls the clinical impact of “tsunami proportions,” the healthcare system is grappling with how to pay for these therapies. When Evidence-Based Oncology devoted an issue to immuno-oncology (I-O) a year ago, the field was in its infancy, and in many ways that’s still true. But as author Bruce Feinberg, DO, writes in the current issue, “One might say that I-O was not just the oncology story but rather the medical story that went viral in 2015.” I-O made magazine covers, was named the “Advance of the Year,” by the American Society of Clinical Oncology, and got credit for eliminating President Jimmy Carter’s brain tumor. 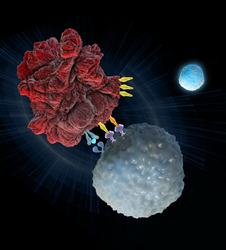 Immuno-oncology agents stimulate the body’s immune system to fight cancer cells; current classes include the cytotoxic T-lymphocyte–associated protein 4 (CTLA-4), programmed cell death 1 (PD-1), and programmed death ligand 1 (PD-L1) antagonist. With three therapies on the market and 37 in the pipeline, I-O was worthy of another look. The current issue of Evidence-Based Oncology, a publication of The American Journal of Managed Care, revisits this exploding area of cancer care from its historical roots to its current challenges and opportunities. For all the promise of I-O, an important theme this year is the daunting cost of treatment, which can easily exceed $100,000 a year and push families toward bankruptcy. Michael V. Seiden, MD, PhD, offers both an historic overview of I-O as well as the current policy challenges in “Immuno-Oncology 2016 and Beyond: the Opportunities, Challenges and Risks.” Seiden notes that things like television advertising are making both patients and the public aware of this new class of agents, and the change is raising questions about how to equitably distribute medical breakthroughs at a time of limited resources. In “The Fight of Our Lives: Confronting the Unmet Need in Lung Cancer,” Bonnie J. Addario writes about the new wave of treatments for the number-one cancer killer after decades without new treatments for this disease. Addario addresses the need for better clinical trial design to capture more patients. A pair of articles by Suzanne Wait, PhD, and EBO Managing Editor Surabhi Dangi-Garimella, PhD, offer perspectives on the very different systems that exist in Europe and the United States, respectively, for gaining access to the most cutting-edge cancer therapies. EBO Editor in Chief Joseph Alvarnas, MD, offers his perspective on the evolution of I-O—that the promising therapies are not the result of sudden discoveries, but decades of painstaking work by many scientists. “Although rhetorically, the image of a ‘moon shot’ may embolden us as a nation to invest more aggressively in pursing new technical avenues in the war on cancer, the growing availability of effective immunotherapeutic agents shows us that the solutions are much closer to home,” he writes.